Last year I started searching for quiet books for Brody and I came across the cutest Etsy shop, Shelley Wallace Designs. They had the best patterns and kits I had ever seen! 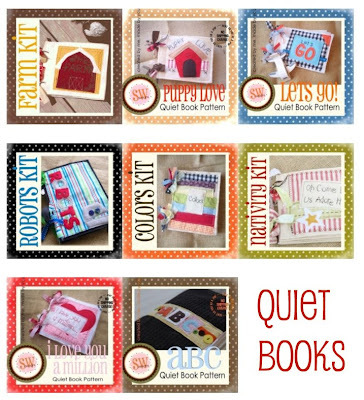 I ended up buying the colors quiet book kit. It was super easy to put together and Brody absolutely adores it. Make sure to check out the darling seasonal kits too. Halloween, Christmas, winter, Valentines and Spring. All patterns are buy 2 get 1 free this month only! Shelley Wallace Design is giving away one free pdf pattern of winners choice. I've had my eye on this shop for a while. LOVE the quiet books! i like you on facebook and in real life! My boys would love the Pirate one. These are so neat! I have never seen them before. I heart her cute etsy shop. I love these. I need to get these and put the together for my daughter and her little buddies that always end up with us at church! I could SO use a quiet book at church. I already follow you on Twitter! Oh yeah! Hope I did the link right!? I love these books! Dying to make some! Win would be even better! Would love to make one of these.. I heart Shelley Wallace designs on Etsy!